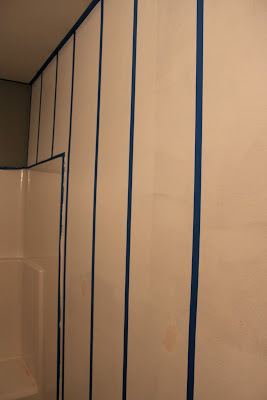 adventuruss: the never-ending bathroom project//phase one. 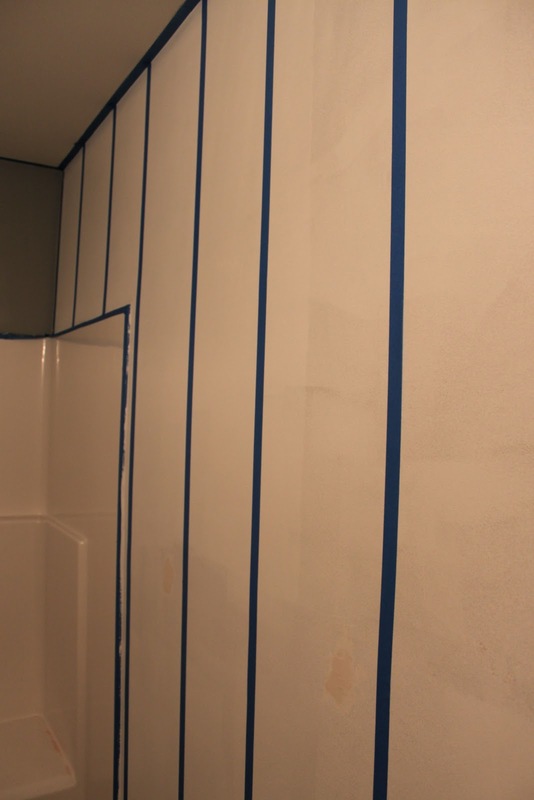 a few months ago, a. and i noticed some striations in the master bathroom, above the shower. as we hemmed and hawed over whether these were drips from our original paint job or a bigger issue, the"drips" kept getting bigger...and bigger. fearing the worst, we high-tailed it to lowe's for some kilz paint- hoping that this would be the solution to our little bathroom dilemma. well, i don't know about you, but one project inevitably turns into many. & this was the case in our little master bath. since we were re-painting, i wanted to change the entire look of this space. originally, we had a sand and coral pallet, but it never really did it for us. we were craving a serene space to start our day & since i've been on a gray and white kick (it's classic, calming, and perfect for our little space) we figured we'd give it a try. 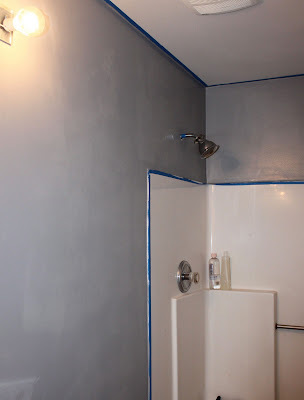 so, we grabbed some gray paint (no test can for this risky couple) and went to town. we instantly fell in love. the gray is very, very cool- and not too dark, which was one of our fears considering we chose the darkest gray on the paint card. 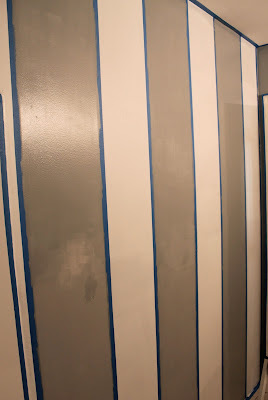 wanting the space to be different, a. and i decided to paint stripes on the largest wall of the room. we figured it would add some personality and class to this otherwise boring bathroom. measuring the entire wall and dividing into the final number as evenly as possible, we figured on one-foot stripes. a. used a level and pencil to initially draw the lines and i followed him with the painters tape, carefully taping along the penciled line. the whole process couldn't have been easier and only took about 45 minutes between the two of us. 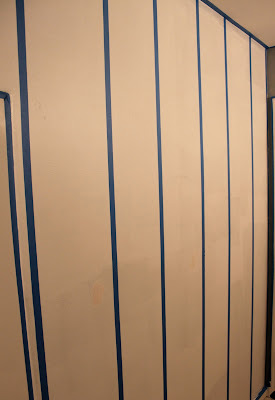 once the stripes were taped, i began painting. 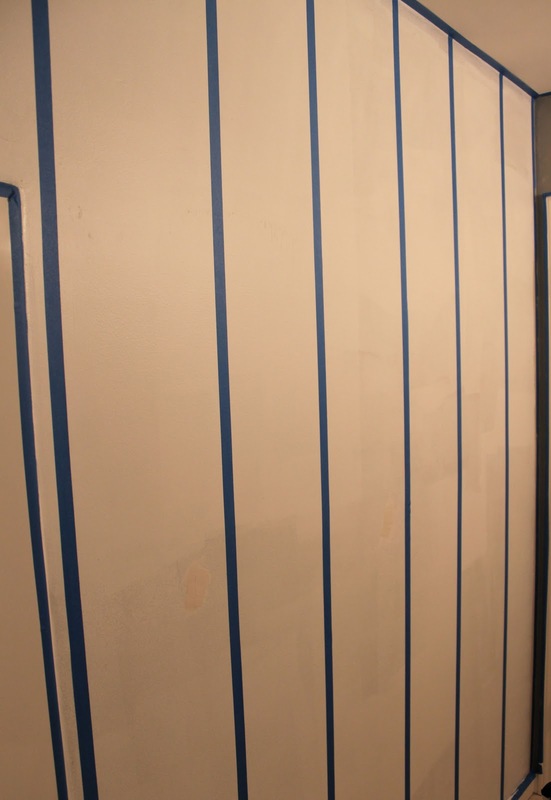 i painted each stripe, let it dry and painted a second layer to make sure they were fully covered. to give you an idea of the size of this bathroom, we only purchased a quart of gray paint. 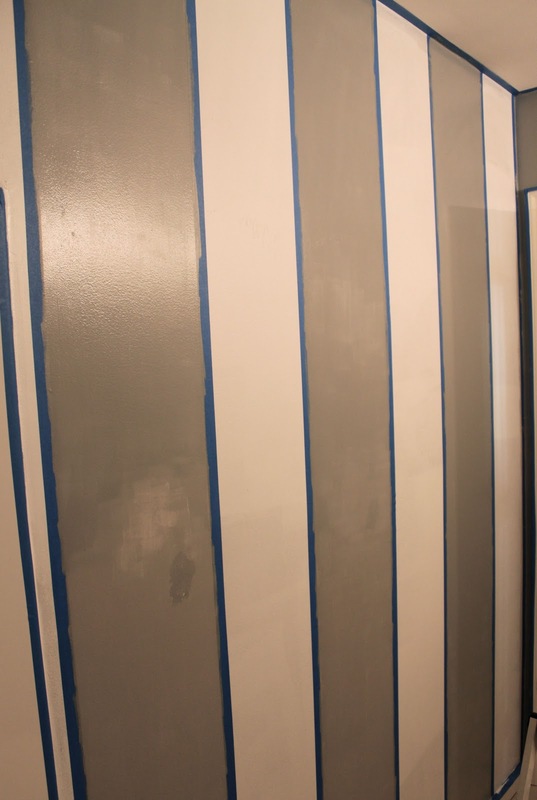 between the solid and striped walls, and two coats of paint, we still have about 1/2 a cup of gray paint left. which is perfect should we find spots that require a touch-up. while it's far from finished, we're already in love. i walk into the bathroom as often as possible to stare at the walls and take in the progress. 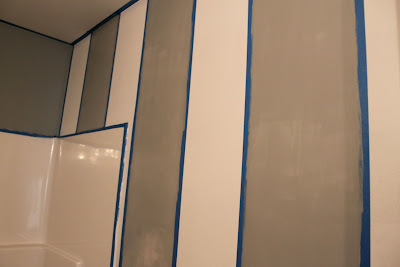 we still have to paint the white stripes and i'm working on a new mirror, shelves and towel bars. but after that, it'll be done and probably, our favorite space in the entire house. I love it! Looks good!